With the Moon out of sight, the early morning of 22 April, will provide good seeing for the Lyrid meteor shower. These meteors are the result of the dusty tail of Comet Thatcher (C/1861 G1). Thatcher has an elliptical orbit, with a period of about 415 years. It will return in 2276. 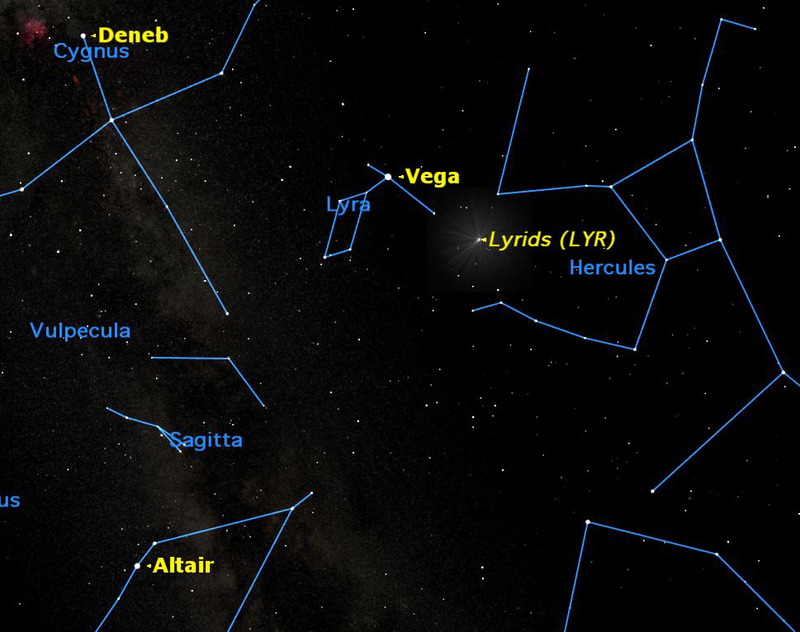 Space Weather has a good article about the Lyrids. For the techies on the audience, the radiant at maximum is at 271 degrees, i.e. RA 18h 04m, Dec +34, which is about halfway between theta and nu Hercules, and not actually in the constellation of Lyra at all. On 15 February 2013, asteroid 2012 DA14 will pass within 22,500 kilometers of the Earth. Geostationary satellites orbit 35,800 kilometers above the surface. This asteroid is roughly the same size as the object that burst over Tunguska Siberia in 1908. 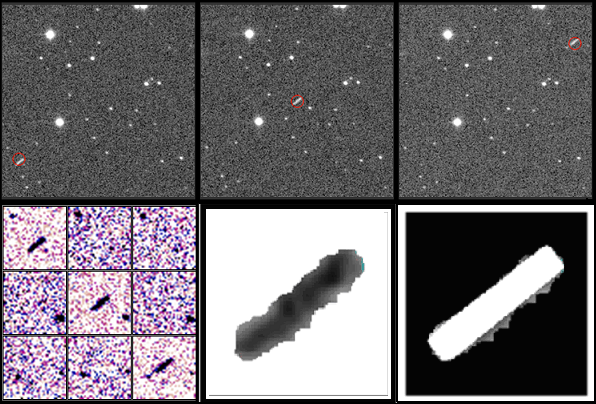 Our friends at The Planetary Society provided the funds that allowed La Sagra Observatory in southern Spain to upgrade one of their telescopes with a new camera capable tracking fast moving objects like 2012 DA14, and determining their orbit. The new instrument has found more than ten Near-Earth Objects (NEO), along with a previously unknown comet. The key to the new discoveries involve fast read-out Charge-Coupled Devices (CCD) and revised image filtering software used with the space-junk tracking program at La Sagra. 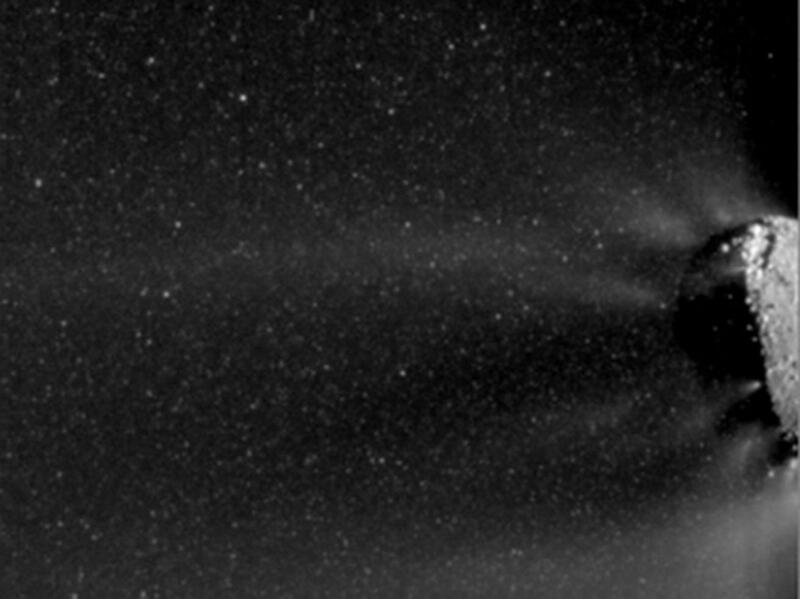 Following the initial images from the rendezvous of the EPOXI mission with comet Hartley 2, NASA has now released additional images of the extraordinary activity of this comet. A movie of the snow storm can be viewed here. Below left, active vents spew icy particles into space. The diameters range from 3 to 30 centimeters (1 – 12 inches). 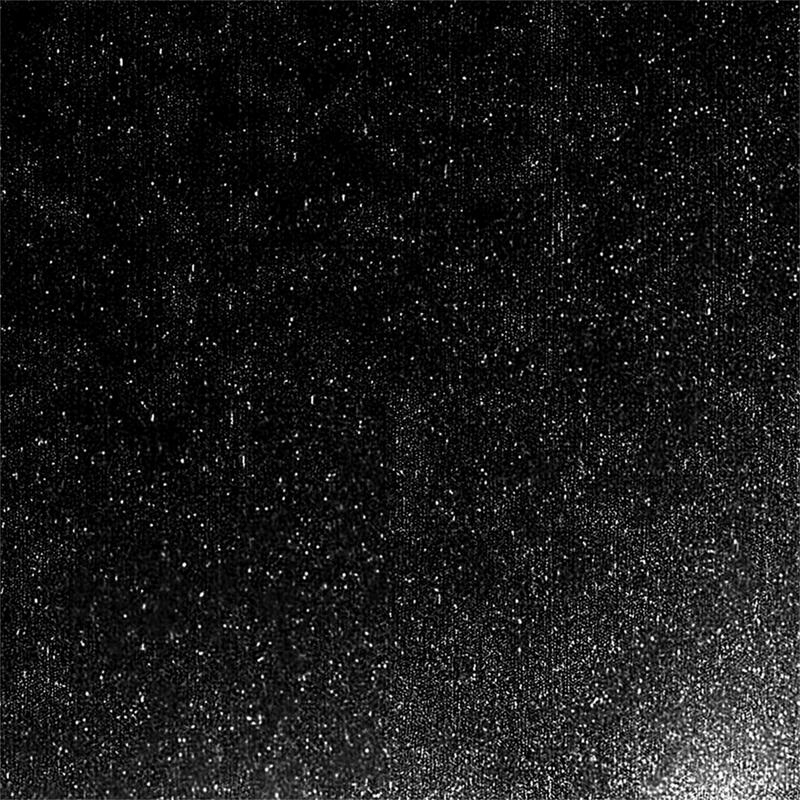 Below right, closeup of the snow storm swirling around comet Hartley 2. 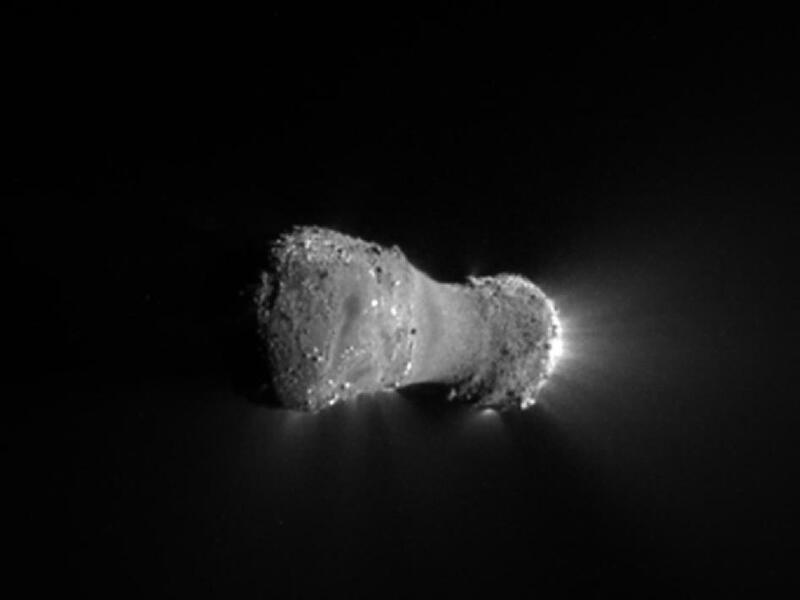 These images are from the left side of the dumbbell shaped comet, as seen from the Deep Impact spacecraft. The right side is much more active, as shown in the press release from Brown University. Active Vents Spewing Snow from Hartley 2. Close up Image of Basketball sized Particles. 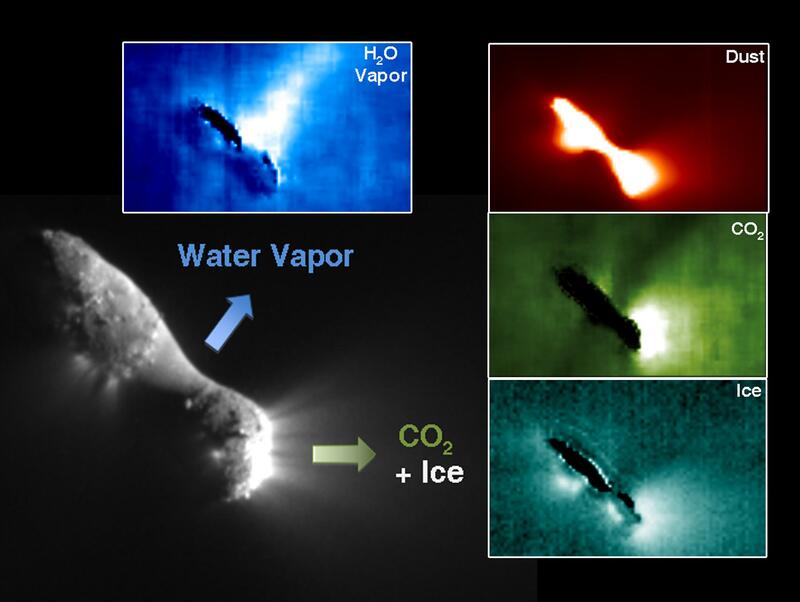 The color image below shows the different sources for water vapor, dust, carbon dioxide and ice. The images are from data obtained by the High-Resolution Imager on 4 November 2010 on board Deep Impact. 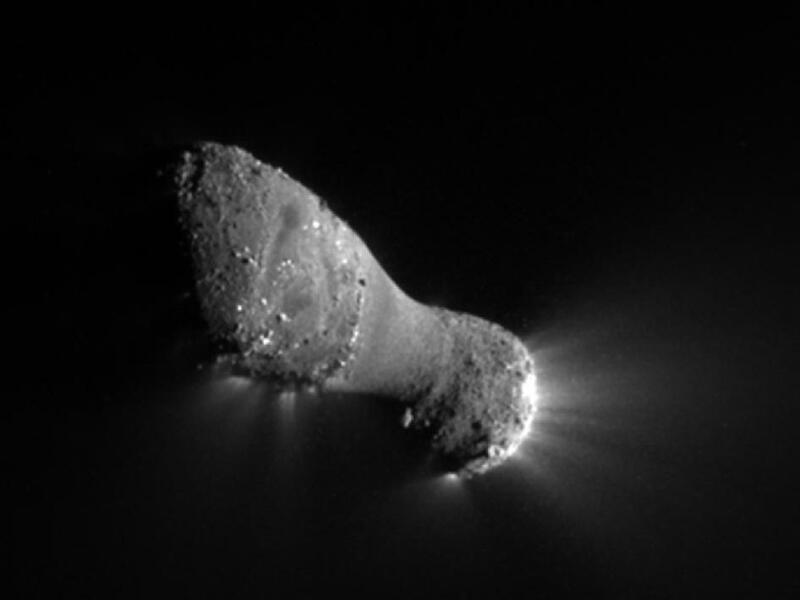 Water vapor issues from a source in the middle of the dumbbell, whereas carbon dioxide (and ice and dust) comes predominately from the small end of the comet (right). Dust is released from the active end and from the vents on the middle of the left end, while ice is spewed from various locations. Infrared Scan of Hartley 2. 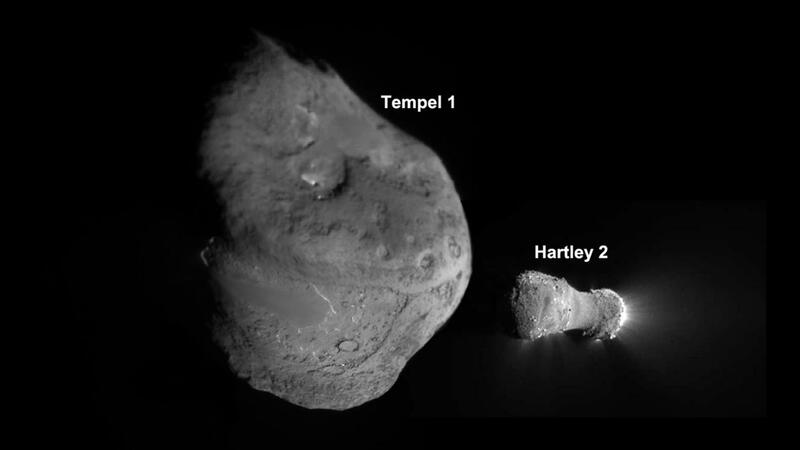 The image below compares the activity of Hartley 2 with the comet Tempel 1, which was the previous target of the Deep Impact spacecraft. This encounter occurred on 4 July 2005, and images of the encounter with the comet and the impactor can be explored on the NASA website. Tempel 1 is 4.7 kilometers on its long axis compared to 2.2 kilometers for Hartley 2. Active jets are clearly visible on Hartley 2, where extensive image processing is required to see them on Tempel 1. Hartley 2 Activity vs Tempel 1. The Jet Propulsion Laboratory at the California Institute of Technology has released this video of Comet Hartley. The images were taken by the EPOXI spacecraft at one hour intervals from 28 October to 3 November 2010 during the approach. The rotation of the comet nucleus is clearly shown and the gases are being spewed most actively from one end. This image was taken during the approach at 7:59 AM Phoenix time (13:59 UTC) on 4 November. The Sun is to the right. The nucleus of Hartley 2 is about 2 km long and 0.4 km wide at the most narrow section. Active jets are clearly visible. Comet Hartley 2 at 700 km. Below is a montage of the five comets visited by spacecraft and photographed up close. 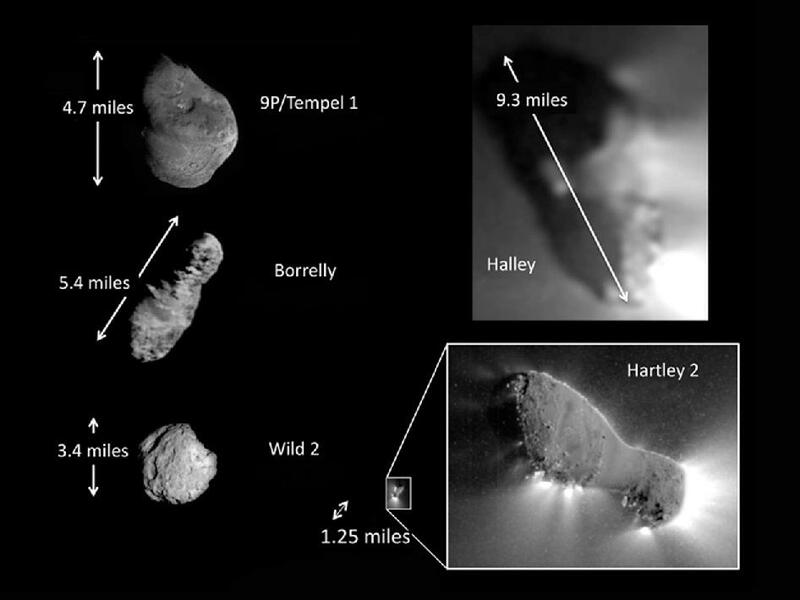 Hartley 2 at 1.25 miles in length is by far the smallest of the five comets, but has the most intense activity in relation to its surface area. Comet 9P Tempel 1 (4.7 miles), was impacted on 4 July 2005 by NASA’s Deep Impact mission, later re-purposed for the Hartley 2 rendezvous. Comet 19P Borrelly (5.4 miles) was photographed in 2001 by the spacecraft Deep Space 1. Comet 81P Wild 2 (3.4 miles) was visited by the Stardust mission in 1999. The mission returned samples of the comet’s tail. Comet Halley (9.3 miles) was visited in 1986 by the Giotto mission and the Vega program. Special thanks go to Bernhard Haeusler for the great animation of comet Hartley 2 shown at the left. The animation was released yesterday morning. The comet is currently leaving the constellation of Pegasus and will approach Casseopeia at the end of September. By the beginning of the second week of October, Hartley 2 will be between Cassiopeia and Perseus, and very near M76 (the Little Dumbbell Nebula). Meanwhile, the EPOXI spacecraft is gearing up for the flyby of comet 103 P / Hartley 2. With the closest approach scheduled for 4 November 2010, the spacecraft is beginning its encounter phase. Spectral maps of gas outbursts as the comet rotates. Infrared maps of the gasses in the inner coma. Search for frozen deposits such as water ice and carbon dioxide on the surface. Determine the size of the nucleus using photographic images. Locate surface features including craters and their distribution and sizes. Map the temperature variations on the surface. Hartley 2 will make its closest approach to Earth this coming 20 October 2010 and its closest approach to the Sun eight days later on 28 October. It should approach magnitude 5 and be visible to the naked eye in dark regions away from cities. For additional information on Hartley 2, see our previous post. Let us know what you think. What do you want to know about? Post a comment. The European Space Agency (ESA) has released new images of Orcus Patera (at right), an enigmatic elliptical depression near Mars’s equator. Orcus Patera is located between the volcanoes of Elysium Mons and Olympus Mons, in the eastern hemisphere of the planet. The relative location can be seen in this map from Google Maps Mars: Orcus Patera is to the right of Elysium Mons (in the center of the map) and left of the huge Olympus Mons. 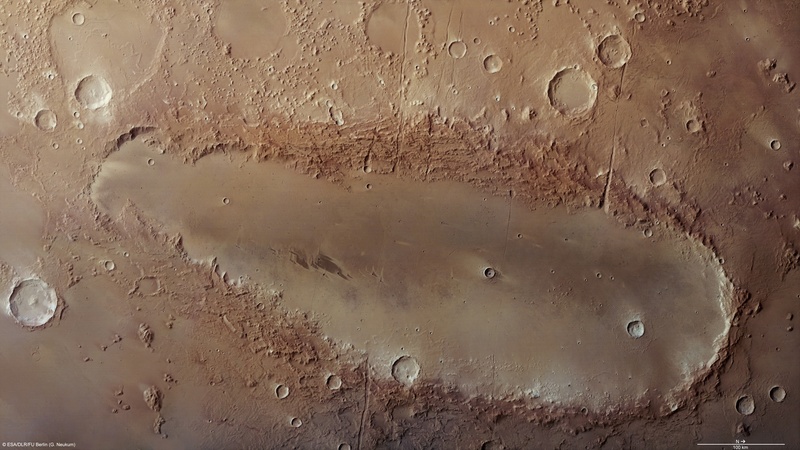 To the right of Olympus Mons is the Tharsis Plateau. The feature is about 380 km from South to North, and 140 km in the East to West direction. The rim rises up to 1800 m above the surrounding plains, and the floor of the depression is between 400 and 600 m below the plains. The most likely explanation for the formation is an impact by a small body at a very low angle. The ESA scientists suggest it was perhaps only five degrees. The impact would have gouged out the furrow, much like Superman’s spaceship did on the Kent farm. 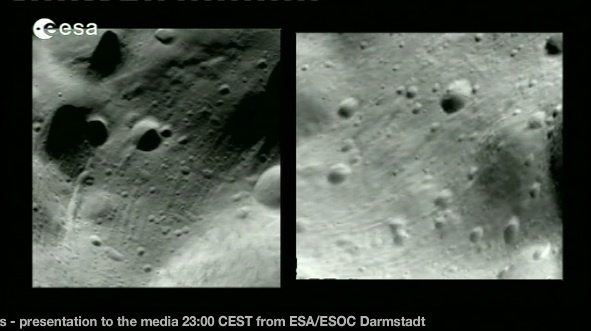 Another explanation involve a series of impact craters that overlapped and then eroded into each other. This requires the good fortune that craters were in alignment and progressed form small in the South to large in the North. The article discusses the possibility that there was an original round crater, which was later compressed along the East-West axis. There are visible tectonic features in and around the feature. Vulcanism is a possibility, as the feature lies between two large volcanoes. The term ‘patera’ is used for deep, complex or irregularly shaped volcanic craters, although this seems the least likely method of formation. Interestingly, no mention of the age of the feature was made. The region outside Orcus Patera seems fairly heavily cratered, while the floor inside the basin seems quite smooth, with only a couple of small craters. This might suggest the feature is relatively young. The Rosetta spacecraft has now completed its fly-by of 21/Lutetia, discovered in 1852 by Hermann Goldschmidt from his Paris balcony. Lutetia was his first discovery, and the 21st confirmed asteroid. Goldschmidt would ultimately discover 13 more asteroids (Nos. 32,36,40,41,44,45,48,49,52,54,56,61 and 70). Following the fly-by of Lutetia, Rosetta is headed for comet 67P/Churyumov-Gerasimenko (C-G) in 2014. Rosetta will spend two years circling the comet and observing its behavior as C-G plunges from 500 million miles from the Sun to 120 million miles at perihelion,and then back out towards the orbit of Jupiter. While orbiting C-G, Rosetta will release Philae, designed to land on the comet. 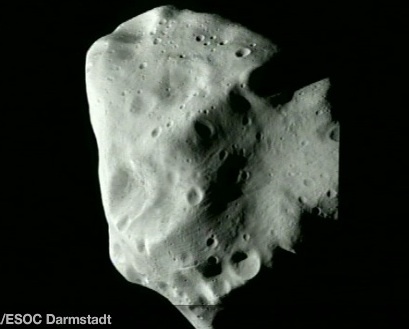 Below are the latest release of images from the Rosetta OSIRIS camera of the Asteroid Lutetia. Note the planet Saturn with its rings, sitting above the asteroid in the first image below, left. See previous posts on Lutetia and Rosetta: Rosetta Encounters Lutetia and Rosetta. Closing on Lutetia with Saturn above. Leaving Lutetia – Night side.